The names above may not be familiar to you. So lets take a look into some of their careers as we get ready for a new album to come, hopefully much sooner than later. Usually we look back at U2. This time we are going to take a look back at these producers and some of the things they have worked on. Back in 2015 when U2 were setting up shop in British Columbia, practicing for the start of the #U2ieTour, we first heard the name Jolyon Thomas. It was later confirmed that he was working with U2 on new songs while the band was in tour rehearsals. His name was first brought up by New York Times journalist Jon Pareles in a podcast and later confirmed with representatives for Thomas by atu2.com. Thomas, 30, is the son of legendary producer Ken Thomas, a producer and engineer who worked with artists including Queen, David Bowie, Public Image Ltd, Moby and more. 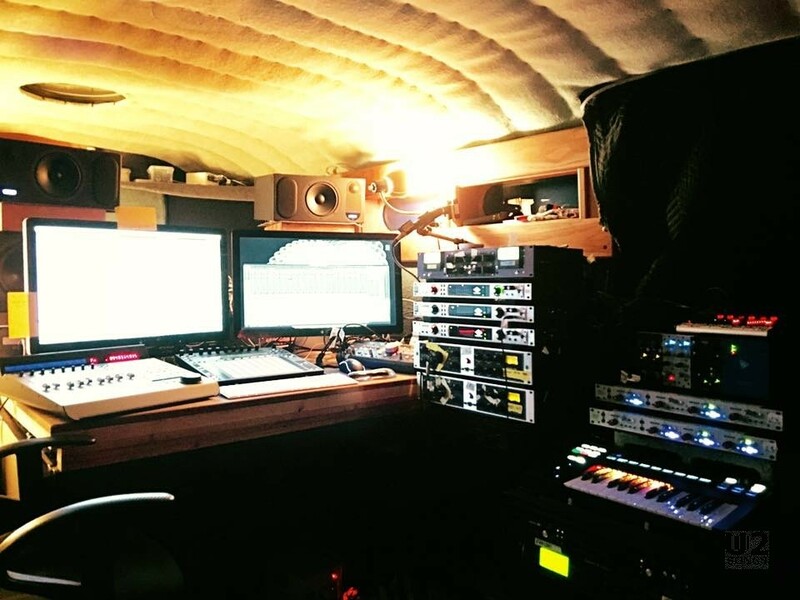 Jolyon Thomas shares a studio with his father in Headley, Hampshire in the UK. For the known work with U2 he wasn’t working in his own studio, but rather in a mobile studio in Vancouver. Thomas started out as mix engineer working with British Sea Power, on the film Anton Corbijn: Inside Out, and as a guitar technician on the M83 album Saturdays = Youth. One of his first projects where he took on a much bigger role was Gavin Friday’s album Catholic. He has been very involved with the band Slaves, acting as producer on their album Are You Satisfied? including the singles “The Hunter,” “Hey” and “Feed the Mantaray”. He’s also the producer on the upcoming single from Racing Glaciers, “First Light” from the new Transformers film. He’s also recently worked with Annie Eve, Daughter, Maps and S.C.U.M. I think the biggest thing I learned from my dad is to really listen to a mix from a producer perspective, trying to be objective, and not get distracted by all the options. It’s so easy to start mixing, and half an hour later your session is covered with plug-ins. I mixed ‘The Hunter’ just once, very quickly, no recalls. Also mentioned by Jon Pareles back in May 2015 was producer Andy Barlow. He was also in Vancouver working with the band on new material. But more recently in April 2016 when U2 was working on the believed final recording of the album at Shangrila Studio, in Los Angeles, Barlow was also posting photos of his mobile recording equipment outside the very same studio. Barlow, is probably most known for his work with the electronic duo Lamb, co-founded by Barlow and singer Louise Rhodes in 1994. In addition to his time with Lamb, Barlow has produced and written his own music under the name LOWB, he’s remixed songs for artists like Elbow and Snow Patrol, and he’s been producer on a number of albums including David Gray’s Mutineers, and The Ramona Flowers album Dismantle and Rebuild. Included below is Lamb’s single “We Fall in Love” from their recent album Backspace Unwind. In March of 2016, The Edge was part of a video for Fender talking about his new Signature Guitar. During the video, we could see that he was in a studio in Topanga Canyon. Dan Basquill tipped us off that it was indeed Jacknife Lee’s studio. And a later video from Adam Clayton would show Lee working with them in the room. Jacknife Lee may be the most familiar name of the list above as he’s worked with U2 in the past on several tracks from How to Dismantle an Atomic Bomb. Lee is an Irish music producer and mixer. His first solo work was released on Pussyfoot Records, a label founded by Howie B. These days Lee is very busy as a producer, working with bands including Two Door Cinema Club, Bat for Lashes, Elle King, and Snow Patrol. His past work has included work with Taylor Swift, Crystal Castles and R.E.M. In 2004 he worked with U2 and was listed as ‘additional production, synthesizers and programming’ on the songs “Miracle Drug,” “Love and Peace or Else,” “Crumbs from Your Table,” and listed as ‘additional production and synthesizers on “City of Blinding Lights,” “One Step Closer” and “Original of the Species,” keyboards on “All Because of You” and “Fast Cars” and the producer, mixing and synth on “A Man and a Woman”. 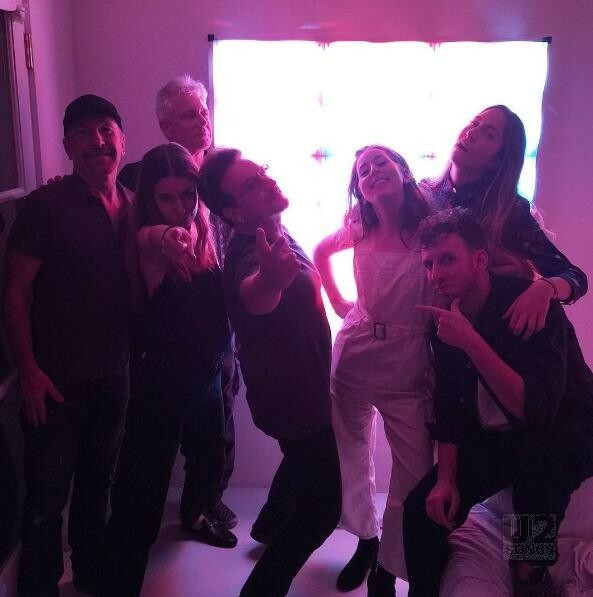 In July 2016, a photo was posted of The Edge, Adam Clayton, and Bono in the studio with the group HAIM, and the producer Ariel Rechtshaid. The picture was posted on U2’s Instagram account. That’s Rechtshaid in the bottom right in the photo below. Rechtshaid’s resume is impressive, having worked with HAIM, Brandon Flowers, Vampire Weekend, Madonna, Adele, Kylie Minogue and many more. He co-wrote and produced Usher’s Grammy winning 2012 single “Climax”, and he took home a Grammy for his production on the Vampire Weekend album Modern Vampires of the City. There is no evidence that Rechtshaid worked with U2 in the studio, other than the photo above, and he may have just been in for a visit with the band HAIM but we’ve included him for completeness. And finally was last night’s revelation from Kygo, at a festival in Norway that not only had he worked with U2 on a song, but that he was going to play it at the festival. And he did. Kygo was born Kyrre Gørvell-Dahll but is better known by his stage name. He is a Norwegian DJ, songwriter, and record producer. He’s worked with a wide range of acts, as well as producing his own music. He’s done remixes for Rihanna, Dolly Parton, Ed Sheeran, Coldplay and Of Monsters and Men. He has most recently worked with Fifth Harmony on songs from their new album. In May of this year he released his first album, Cloud Nine which has charted well throughout Europe. His new single from that album, the sixth single is “Carry Me” featuring Julia Michaels on vocals, has just been released and is the song that he is expected to be promoting during his appearance at the closing ceremonies of the Olympics this evening. Kygo has a few upcoming appearances planned including performances in Ibiza, Spain on August 25, Seattle WA on September 2 and Las Vegas NV on September 3. No word yet on whether or not he will continue spinning the new U2 track at his own appearances. It is not known if Tedder was in the studio to work on tracks from the album, or if maybe he was just visiting. Tedder worked on the songs “The Miracle (Of Joey Ramone),” “Every Breaking Wave,” “Song for Someone,” and “Iris” on U2’s Songs of Innocence. He’s also worked with a wide array of artists including Maroon 5, Elle Goulding, Rob Thomas, and Demi Lovato. U2 has also been working with Paul Epworth who was part of the production team on the last album. Epworth is an English music producer, musician and song writer. Epworth own the studio The Church in London England, and it is known that The Edge has spent some time in the studio in early 2016 working, most likely, on Songs of Experience. U2 also worked in that studio in 2014 when they were working with Epworth on tracks for Songs of Innocence.